So me and my boyfriend booked us in at the Hotel Amerikalinjen. It is quite new, but an old building wich has alot of history. The room itself was pretty nice, good bed not so much noise ( and our room had the view on the buisy side) bathroom was super nice, Free WiFi and build in speakers (for music, so nice) Small details made it all really good. We took some drinks before a dinner booking we had some where else, it was pretty good. Not that cheap, but Worth it. We actually came back after to take some more drinks at their bar, since it was so nice before dinner. Like i Said the drinks where pretty good ( not the bill afterwards) i think some of the drinks where 165 kr each. The level is high tough. There was not so much variation, some of the vegetables where dry, pancakes was really cold and dry. Well i could continue. So a big minus for the breakfast part. But maby this was only one time happening, but i hope they will expand their food choises, cause it was poor. But the Staff was super nice, happy and they treated each guest as if you owned the place. That makes me happy. Enjoy your stay, i did. First trip to Oslo, but rewards member of Choice Hotels. Chose Amerikalinjen because of its location to Central station. I have never stayed at a hotel where staff were as warm and friendly as this stay. Every time we walked by the front desk, we were treated with a smile and "do we need anything?" Each morning, the breakfast staff greated us the same way. One afternoon the bar wasn't open, but the restaurant staff, some from the morning, made us feel very welcome and served us drinks. Our room was small by American standards, but similar to many in Europe. One negative. During our above mentioned visit to the restaurant our last afternoon, we asked to speak to the manager, later identified as the Food and Banquet Manager, to personally recognize how staff positively interacted with us. We were advised he needed to change clothes and would come see us. We waited approximate 20 minutes and he never came. He actually walked in front of us and made no effort to speak with us. I normally do not like making negative statements that identify individuals, but he is a manager. Yes, I highly recommend this hotel. The staff and facility is fabulous! Amerikalinjen is a brand New hotel bang in the city center. It's right by the central station and the opera. A 5 min walk to the barcode area... there are no flags or logos to give the hotel away (not yet at least). But, once you've found your way to the front desk it's all smooth sailing from there! 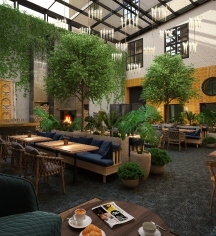 The decor is boutique style in a way similar to the Hoxton Hotels for example. A bit New York -ish with black accents and white tiles. My room was rather small but the bath room was the same size as the bed/living room. . Luxurious! Some things were a bit off but I'll forgive that due to the recent opening of the hotel. Would love to stay again! Breakfast is extensive but would need some more vegan/plant based options. .
Made with cows Milk. That's first to me..
We had a wonderful stay at Amerikalinjen. The Check-in was a nice experience; smoothly and efficiently. The Fortuna Suite had the perfect view and was spacious and had the best bed ever! All amenities that you would need were in the room, even a handheld steamer for clothes in addition to the regular iron. An enormous shower, the softest and largest towels added to the experience. Room service(ordered a burger and cookies)was great. Breakfast was a little unorganized. Too many people and too many dirty but empty tables. Miss the regular bread, but since I make bagels at home I managed to make a nice breakfast even though. An italian working at the kitchen was really not into pleasing customers, he just gave a harsh <<No>> when I asked for more cream cheese, but he did regret it and came with a plate of it shortly after. So all in all- minor details. From a safety perspective I really miss having a phone in the room. I have travelled extensively the last 2 decades and stayed at numerous hotels(I also have a degree in Emergency Management) so I cannot help but keep risk awareness in the back of my Head-like hotel fires and other emergencies. What if my own phone did not work and I faced an emergency situation? Anyways - if you haven't tried Amerikalinjen yet- run and do so! Perfect weekend get-away. For couples it is superromantic! We had a perfect stay, and we are definitely coming back! We even bought the coolest umbrella to take with us home! Greetings and thank you very much for your kind and well detailed review about our property! Amazing to read that you had such a great stay at Amerikalinjen, and enjoyed our room service. I couldn't agree more with you, The Fortuna Suite is perfect for a romantic stay here at Amerikalinjen. About safety at our hotel, we have all the equipment required in order to guarantee the safety of our guests. We have ordered phones with special design and it will arrive soon, until it happens you can chat with reception with the number that you find at welcome letter in the room. I am glad that not having a phone in your room didn't change your experience at Amerikalinjen and I am sure that next time you come for a visit we will have phones in all the rooms. I wish you a great day ahead. We are looking forward to see you again. 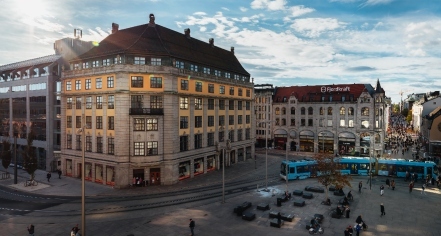 An amazing hotel perfectly located in Central Oslo near the central railway station. We were directed to this new hotel late at night on arrival in Oslo after a mix up with our previously booked hotel. What a bonus! What a wonderful surprise! Newly opened in March 2019 in a beautiful building formerly the Norwegian America shipping HQ, this hotel is brimming with lovely architectural features.Our room was spacious, beautifully appointed with a superb modern bathroom and the most comfortable bed. The staff were so helpful, courteous and efficient. The meals both evening and breakfast couldn't be faulted. Highly recommended. This hotel is a gem. Thank you for staying at Amerikalinjen and for taking your time to write here on Tripadvisor! I am delighted to hear that you had a flawless stay with us and that you liked the details in the hotel. There is so much history in each and every piece at Amerikalinjen, so much soul, heart and dreams from those who traveled to America and from us who now have the honor to work here. Every day we write a new chapter of the history and we are thankful that you are part of it. We are already looking forward to see you again.